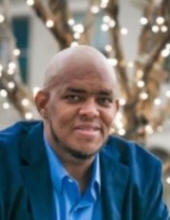 Roger A. Wallace, aka “Peanut", 47, a resident of Hattiesburg, MS passed away on January 31, 2019, at Gulfport Memorial Hospital in Gulfport, MS. He was born in Ocean Springs, MS on September 21, 1971, the son of Warner Roger Wallace and Amanta G. Wallace. He graduated from Ocean Springs High School and attended MS Gulf Coast Community College in Perkinston, MS. Roger was married to Gwendolyn White Wallace on November 30, 2002. Roger appreciated life and lived it to the fullest. His favorite phrase was “Don’t worry bout me, I’m gonna be alright!” As a child, he developed a love for cooking by working with his parents in their restaurant. As a result of this love, he opened Alexanders’ Home Cooking Restaurant in Hattiesburg, MS. Because Roger treasured every moment given to him, he enjoyed favorite pastime activities such as traveling, fishing, golfing, visiting the coastal casinos, and making people laugh. Additionally, Roger had a passion for giving back to his community. For this reason, he became a member of the Distinguished Gentlemen of Ocean Springs. Roger was an avid fan of the “Dallas Cowboys” and the “Los Angeles Lakers”. Although Roger loved life, his love is best described by the love he showed for his wife and children. His love for his beautiful wife was the epitome of Ephesians: 5:25-33. He loved Gwen more than life itself! As a Father, Roger provided for his children by exposing them to every opportunity within his reach. His ‘gentle giant’ spirit will live on in his family. Equally important, Roger had a personal relationship with God. Roger knew that God had no limits; therefore, he trusted in God and enjoyed his life to the fullest. Roger was preceded in death by parents. Roger is survived by his loving wife, Gwendolyn of sixteen years; One daughter, Alexandria Wallace; One son, Rylen Wallace; One god-daughter, Elysiah Cunningham; One sister, Joie Wallace of Hampton, VA; Three brothers: Ennis Wallace of Ocean Springs, MS, Oliver (Damaris) Wallace, of Colorado Springs, CO, and Gregory Curry of Gulfport, MS. A host of aunts and uncles whom he loved dearly, especially his traveling buddy “Uncle Eddie”; One sister-in-law, Qwyncie Thomas of San Diego, CA; Two brothers-in-law: Kaedyn Thomas of San Diego, CA and Kenneth Thomas of Los Angeles, CA; Mothers and Fathers-in-law, David and Alice Morrison (whom he adored) of Natchez, MS and Ken and Lori Thomas of Los Angeles, CA; and a host of adorable nieces and nephews. To send flowers or a remembrance gift to the family of Roger A Wallace, please visit our Tribute Store. "Email Address" would like to share the life celebration of Roger A Wallace. Click on the "link" to go to share a favorite memory or leave a condolence message for the family.